strength | God's Abundant Blessings! 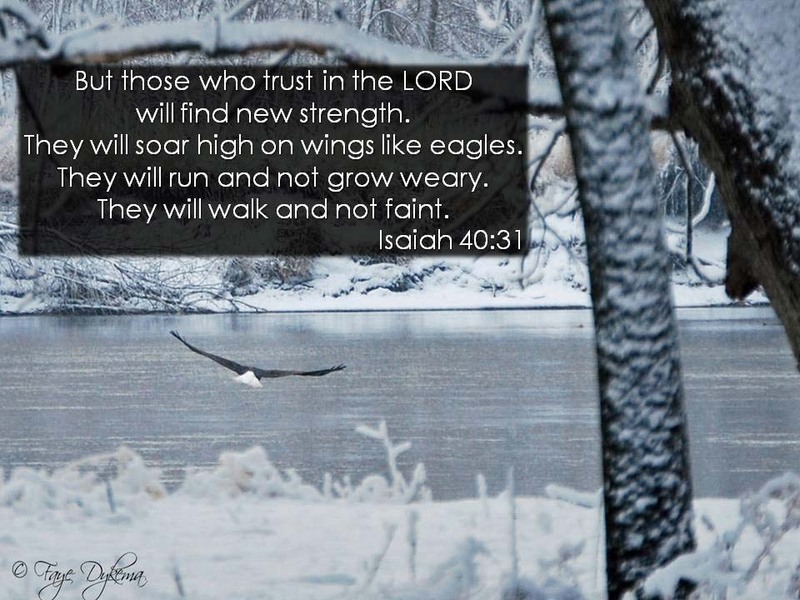 One of my dad’s favorite bible passage has been Isaiah 40:31. So for sentimental reasons alone, it’s been meaningful to me. I think of it more often because November through March we are blessed with seeing eagles near the river. They are an amazing creature. They can soar without flapping their wings, or take off with just a few strong flaps of their wings, and they are quickly lifted on the air currents. Then they can dive straight down to the river or corn field for their prey. I’ve watched two of them doing their air dance as they mate and play with each other. They never seem to tire when they are enjoying being carried by the wind. All of Isaiah 40 tells us of the secret of waiting on God, the anticipation and hope of His sending His Son to save us completely from our sins so that we may enjoy the glory of God. Verse 8 reminds us that God’s word will never fail, but it endures forever. Look, it has lasted for thousands of years giving guidance, comfort, encouragement and hope. When I question what God is thinking, in time, in His perfect time, He reveals His plans. I’ve seen it time and time again. (I wish I’d learn, remember and trust Him more quickly.) Recently, God allowed me to see how even in His encouraging and prompting me to write this blog, He was preparing me for something else. It looks like I’ll be able to use some of the skills I’ve learned here with WordPress in my new job. If I had known I’d be taking on this project, I’d have been filled with a lot of stress and anxiety over it. But because God prepared me, in advance of this project, to learn the some of the WordPress blogging process, I’m even more relaxed letting things go to God in prayer. He’s had it all in His plan (Jeremiah 29:11). I’m being reminded daily that if I resist anxiety and WAIT EXPECTANTLY for God to lead me, I’ll discover strength, resources, joy, hope and unexpected blessings for the journey ahead. I am filled with God’s strength, renewed by His precious words, and encouraged once again to Wait Patiently for God.